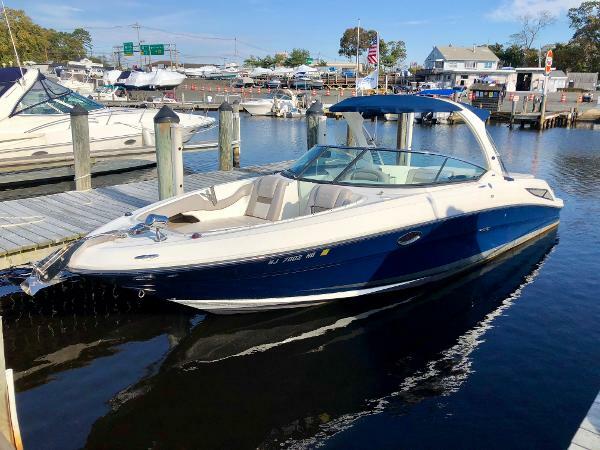 Big Price reduction now a great deal at $66,633 2009 Sea Ray 300 SLX w/ T Mercruiser 350's axius Bravo 3 drives (483 hours) joy stick docking. 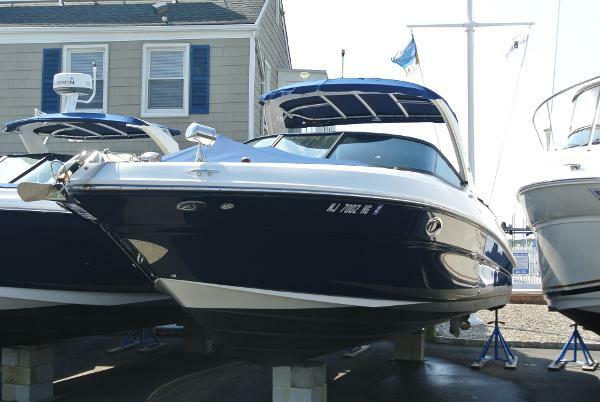 This is a Marinemax trade and all service is up to date & full detailed. 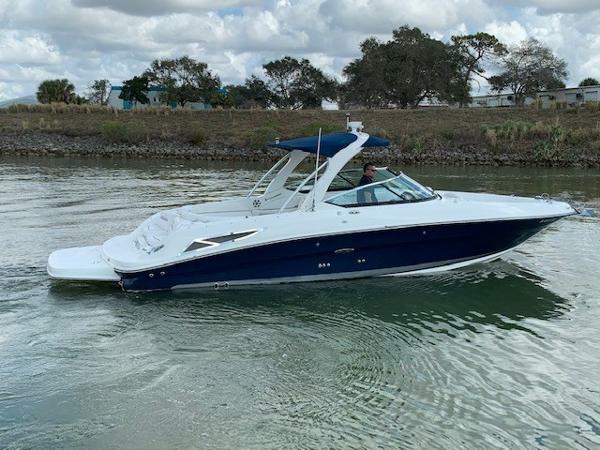 Factory Options: * T- Mercruiser 350's magnums w/ axius drives & joy stick docking (autopilot & sky hook standard) * Blue hull sides * Windlass * Vacuflush head * Garman 12" GPS * VHF radio * Polk momo sound sytem * Radar arch * Bow & cockpit cover * Extended swim platform * Underwater lights * Built in battery charger & more...... Service: New exhaust risers & manifolds July 2017 "B" major service completed November 2018 All new batteries March 2019. 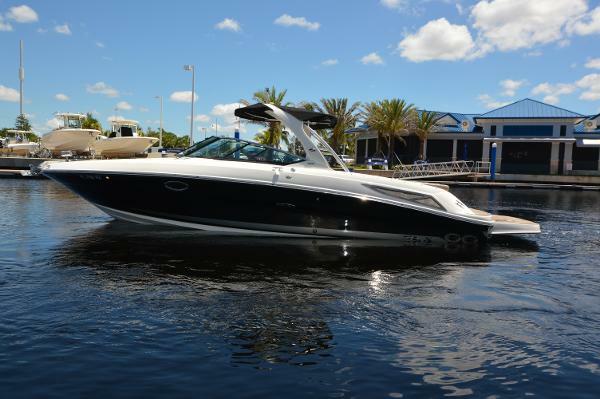 The 300 Select EX, is a premium runabout that boasts the perfect blend of muscle and sophistication. 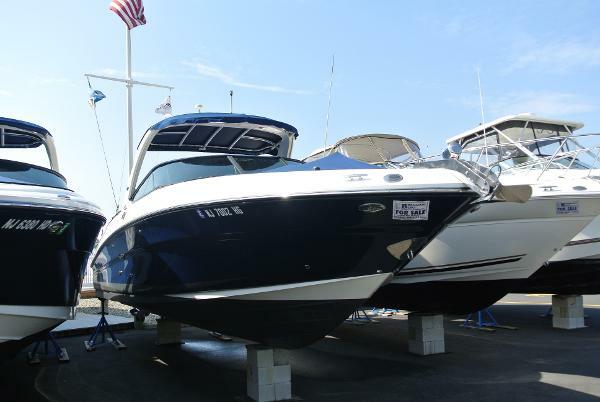 The boat comes standard with power-assisted steering and runs on a proven 21-degree hull for big-water acuity. 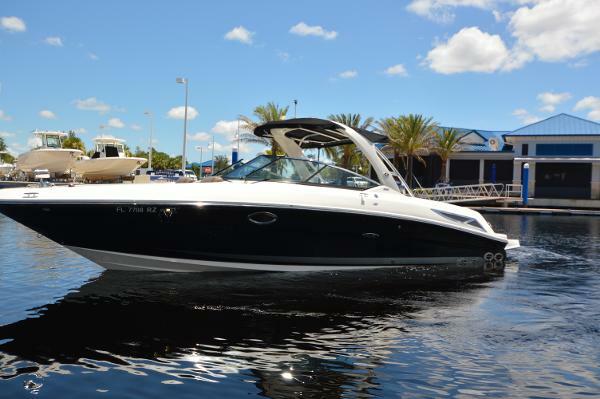 Twin Mercruiser 350 Magnums, offer enhanced maneuverability and truly sizzling speeds. Starting with the helm, the 300 Select EX is stacked with fine features. The sleek dash incorporates an upgraded 12" Garmin color chartplotter. The wood-accented wheel comes with Vessel Control System (VCS) thumb pads to manage the SmartCraft diagnostics and stereo functions. That stereo, by the way, is an updated Fusion MS-NRX300, amplifier and six speakers. The console opposite the helm houses a head compartment with a VacuFlush toilet, sink, pullout sprayer, and storage cabinet with mirrored door and light. The whole thing is molded fiberglass for easy showering and upkeep, and its lockable for privacy or storage. The 300 Select EX has a ton of space in its cockpit. 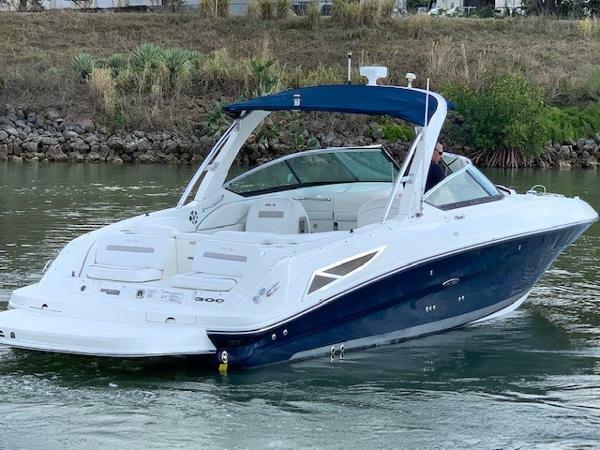 Theres a back-to-back sliding lounger to port, across from the adjustable bucket helm seat with flip-up bolster, behind which lies a wet bar with solid-surface countertop, stainless-steel sink and tip-out trash receptacle. A U-shaped cockpit lounge backs up to the transom. 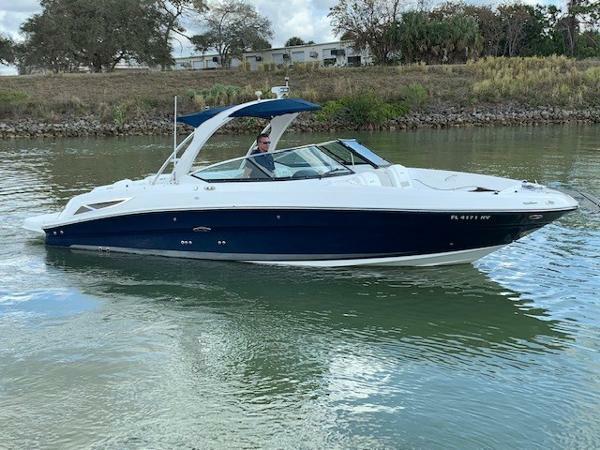 But the most head-turning features here are the two aft-facing seats that look out over the water, inviting long hours of relaxation and conversation at anchor. A cockpit table sets up easily for alfresco dining; it has its own dedicated storage up front. 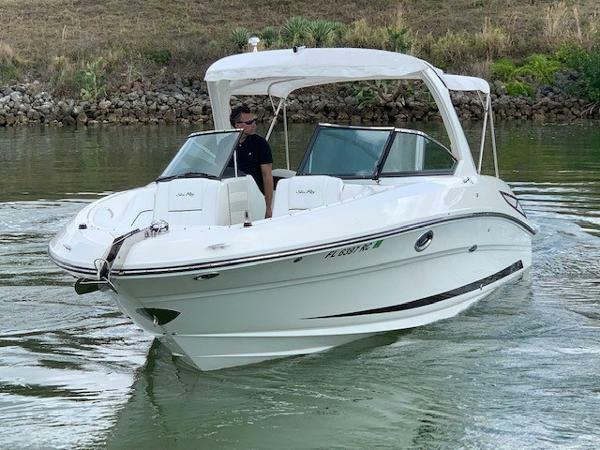 Beyond the center transom walk-thru, an integrated swim platform offers a storage hatch, telescopic ladder and stainless-steel ski tow eye. A giant, optional, extended swim platform takes the waterfront acreage to amazing new dimensions. At the other end of the boat, there is lots of room on the wraparound bow lounges to really stretch out and enjoy the ride. Angled backrests, coaming pads, molded armrests, cup holders, stainless-steel grab handles, anchor locker  theyre all here. 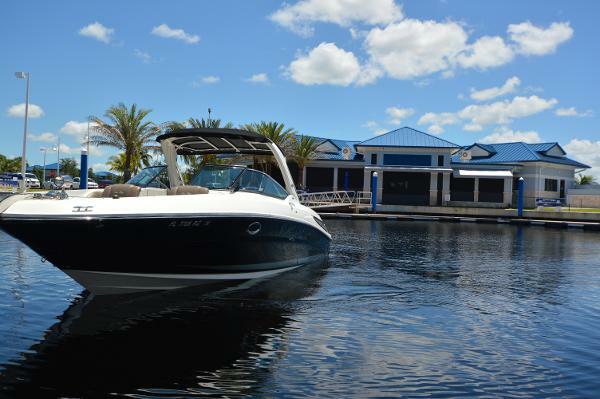 The fiberglass and aluminum tower with integral bimini is another standard feature.